October 2, 2015 October 2, 2015 ~ Trevis Dampier Sr. So it’s raining today in the Bay Area and I need something wholesome, warm and tasty to enjoy this fall weather. A soup would be nice..
Not just any soup. How about some clam chowder! Yum! Now, where can I get some clam chowder in the middle of the silicon valley away from any beaches outside of an hour. So I immediately jump in the car with anticipation of not only slurping a nice thick, hearty clam chowder soup. But also, to dip these untouchable, award winning, salute deserved, cheddar garlic biscuits into my soup and then place them in my mouth to just melt with utmost satisfaction. I arrive and sit down and immediately order my soup. After my order, the waiter comes back with these heavenly biscuits within about 10 minutes. Just looking at them makes my mouth quiver and makes me start kicking my leg under my seat like a 2 year old boy as I bite into them. Each bite is a taste of unbelievable goodness! The biscuit is flaky and soft..Oh so buttery and oh so garlicy. The perfect blend of ingredients that just brightens up the entire galaxy. Then my clam chowder arrives, steaming and winking at me to bring these biscuits on a swim. So I dip them in and take a bite.. The blend of this tasty, flavor bursting steamy clam chowder instantly hit me, combined with the buttery garlic flakes of the biscuit that just make this a 4th July explosion in my mouth. Next up I concluded this wonderful meal with some fried shrimp. I made sure to get some tartar sauce to dip these crunchy critters into and now the party has begun! Nothing like a crunchy piece of succulent shrimp for the taste buds combined with the tanginess from the tartar sauce. Each bite was the entire shrimp except the tail going down my throat with a great crunch in between. Instant gratification! True live action living! Good job Red Lobster! < Previous I must be deranged for not eating more PF Chang’s! Next > You’re Gonna Need Time to Recoup after eating Butter and Zeus! Hello. This is Phil A Mignon here. 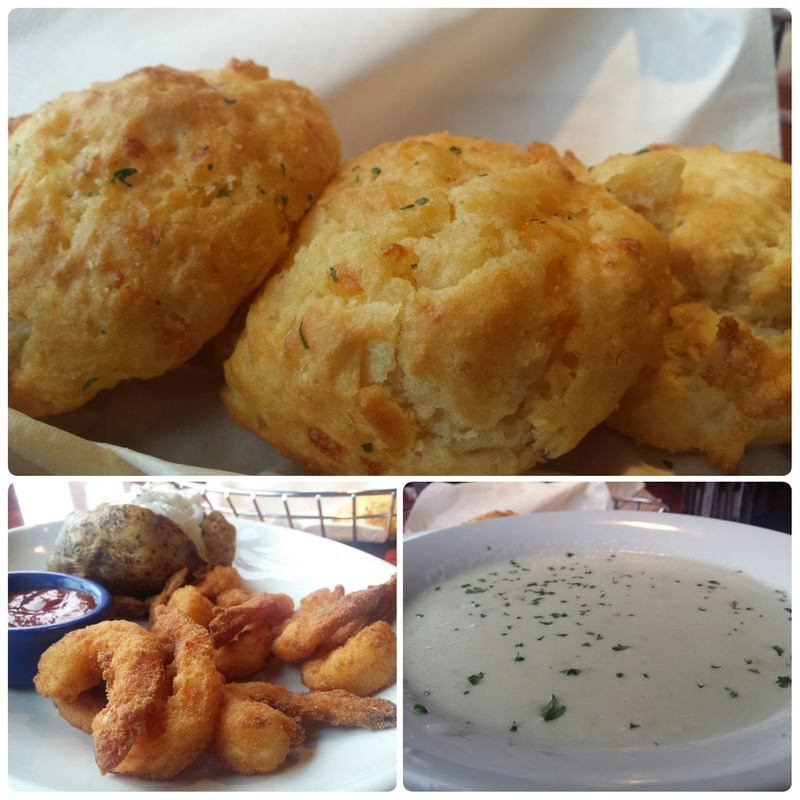 I love them biscuits at red lobster. I enjoy them with steak. I can tons of those biscuits Phil. They are just out of this world good! Good with steak..good with crab..good with anything!